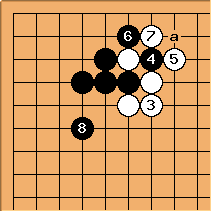 After exchanging for , White is left with two cutting points. d (see the query about this loose connection). White has outside influence, Black considerable territory. Black can aim at a later to start an endgame ko, i.e. White can't expect to make much territory along the edge. may be played at a. With Black can push once more at , keeping White low on the upper side. After Black can only defend at and can't block at a. 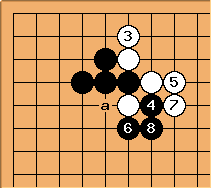 If Black blocks, White can play at itself, taking the corner one way or another. 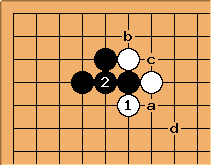 is sometimes seen in professional games where White is strong on the upper side and does not wish to concede a large corner (as after a) or be kept low (as is likely after b). See attach-block for the fundamental shape here. 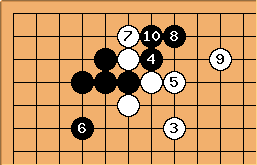 A first interesting point about this joseki concerns . Can White omit this play in order to leave a weakness at the 3-3 point in the corner? That idea is really in the realm of handicap go: playing the atari is undoubtedly the honte. There is an example from a quickplay game Cho Chikun-Kato Masao 1990-09-09, as here. 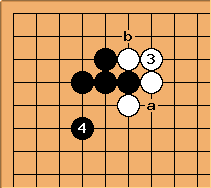 After Black made strong shape with , and White invaded at once with , making miai of a and b. 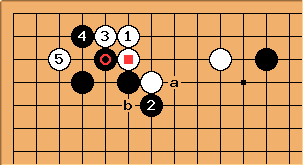 In general this would be considered a thin way for White to play. 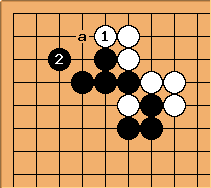 This Chinese classical joseki frequently occurs in old Chinese games when the marked stone approaches hoshi only after the two stones at the right have been played. Instead of , white a black b might be possible. The overall aim here is probably to settle white quickly. 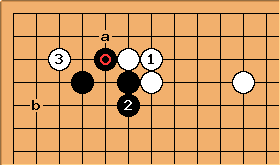 Patrick Traill: Leela 0.11.0, when playing against a six or seven stone handicap, sometimes plays the loose connection at , which I tend to treat like the solid connection, with atari at ; Josekipedia says this is used when Black is strong nearby and suggests (and further as in the diagram, quoting a Tygem special lecture, but Leela does not follow that) or at (no continuation) – any comments?